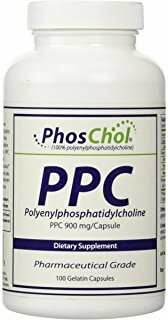 Phoschol® contains a pharmaceutical grade phospholipid that restores the integrity of cell membranes, including membranes of mitochondria within cells. While the nucleus is the gonad of the cell, membranes are the brains. Pro-inflammatory fatty acids are peroxides that damage cell membrane phospholipids, and self-perpetuate by turning the polyunsaturated fatty acids in phospholipids into peroxides. If there is inflammation there is membrane damage. The cytoprotective effects of Phoschol® has been demonstrated in innumerable laboratory and clinical studies over many decades. Its proven benefits range from repairing the gut-liver-brain connections in ASD (autism spectrum disorders) and increasing athletic endurance, to those for the aging population: enhanced memory, restoration of gastrointestinal mucosa, activation of liver detoxification and renal function, influence on atherosclerosis by cholesterol mobilization, and improvement of the coronary, peripheral and cerebral blood flow. Each bottle of PhosChol® contains 100 gelatin capsules. Take 1-3 PhosChol gel capsules at one meal per day.